1) Diving Deep into Deep Point of View – This month-long, online class, led by Rhay Christou over at Margie Lawson’s Writer’s Academy, is one of the best investments I’ve ever made in my career. (And it was relatively cheap, only $60.) I’ve read books on Deep Point of View before, but there’s nothing like breaking it down in a lesson format and actually applying it to your own work. Plus, you get to learn from Rhay’s feedback and she is obviously a master at Deep POV. For those who don’t know, Deep POV is when you remove as much authorial interference from your writing as possible so that the end result is that the reader feels like they are in the character’s skin, experiencing everything along with them. It works in both first and third person. This was my first time writing in third person, so it’s been fun to go back and take out all the filter words and stage direction that isn’t needed. It really does make a difference. I can’t wait to apply these same techniques to my unpublished first person MS and watch them get stronger. This class seems to be offered twice a year (last time was in November) so if this interests you keep an eye on Margie’s site or follow Margie (@MargieLawson) or Rhay (@RhayChristou) on Twitter to find out when she’ll be teaching it again. Me taking notes with my smart pen. The pen transmits the to receiver clamped to the top of the page, which relays what you are writing to a program on your device. 2) My Smart Pen – I read an article a few months ago about a pen that converts your handwriting into text and was immediately intrigued. You see, I do a LOT of research for my historical fiction novels (approximately 12-25+ sources per novel) and that means a LOT of notes. I hand write my notes because I retain information better that way than when I type it. But when it comes time to plot, or even write a blog post about what I’ve learned, I need those notes in typewritten format. 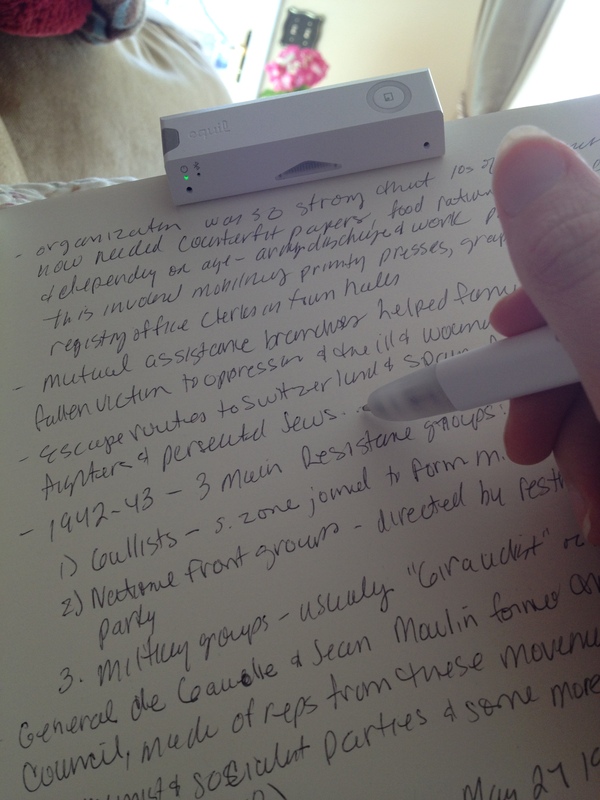 After typing up two books worth of notes but hand, I realized there had to be a better way. Enter the Equil Smart Pen 2. It uses blue tooth technology to record your notes as you take them on your smart phone, tablet or laptop. It’s kind of freaky to write on one surface (I write in notebooks since this pen isn’t limited to special paper like some others) and watch your handwriting appear on your device. The pen uses real ink, but relies on a program called Equil Note to capture your writing. It isn’t available for Kindle and I couldn’t get it run on my Windows laptop (as soon as I can afford it, I’m switching to a Mac), but it works like a dream on my iPhone. I haven’t tried to convert it to text yet and I do expect some blips (especially with my horrid handwriting), but anything is better than typing from scratch. 3) Gaining Recognition for My Writing – Remember that post I wrote last month about not knowing if my romantic comedy will ever get published because it isn’t easily classified as romance, women’s fiction or chick lit? Well, it may not have a book deal yet, but it did win the single title romance category of the Great Expectations contest, sponsored by the North Texas chapter of RWA. This is one of the bigger romance writing contests, so I’m hoping that having this win in my bio will help when I start querying again soon. (For those who don’t know, my former agent is no longer an agent.) Plus, I’m in several other contests. So, what’s rocking your world, writing or otherwise? Share the happy vibes! My monthly post at Spellbound Scribes. Congrats on the contest win, Nicole, and OMG I love Rhay! I’ve learned SO, SO much from her over the last couple years. She’s smart, and kind, and a fabulous teacher. I’m so glad you took her class. Thank you! She is amazing! I’m so glad i met her. I have a feeling this is just the first of many things she’s going to teach me!